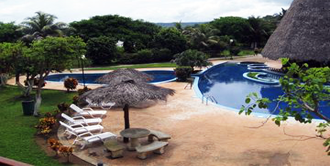 The Resort is located at Salinas Bay, La Coyotera Beach, northwest side of Guanacaste province, this part of the country is known for it’s beautiful beaches and ecological protected areas. Surrounded by the National Parks of Santa Rosa and Rincón de la Vieja Volcano, we are a fabulous option for those who love the peace of nature and the beautiful pictures of the beach, we are the perfect combination between modern architecture and the most exuberant vegetation. The resort has direct access to ½ mile of virgin and private beach, we offer beautiful gardens of exotic flowers. At Ecoplaya resort enjoy the comfort of our fully equipped villas, international cuisine, the exuberant beauty of untouched beaches, as well as the jungle and wild life.